I looove guacamole. 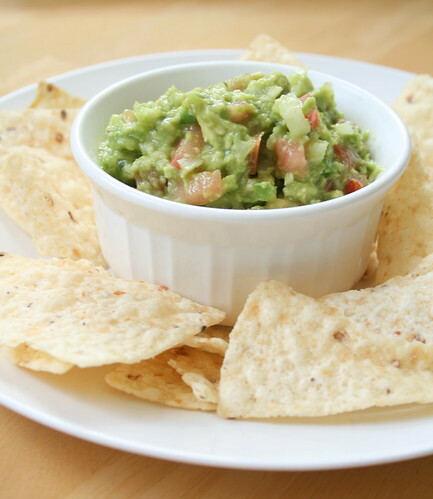 Not only is it my favorite dip (chips are just the vehicle for large scoops of guac), but it's also my favorite topping for tacos, burritos, burgers, sandwiches, breakfast bagels (try it on a bagel or toast with scrambled eggs, mmm...), or whatever else I can think of that would benefit from a hit of avocadoey goodness. So I knew right away what I was going to make with the two avocados in our CSA box. Everyone makes guacamole a little differently. It can be smooth or chunky, with or without tomatoes, and include a few herbs and spices. Here's how I make my guacamole. First of all, it has to be chunky with no dairy fillers, so no mixing in sour cream or *shudders* mayo into the guacamole. I throw in some diced tomatoes because I like the bright red color adds. I skip the cilantro because Steven absolutely hates it due to a genetic quirk that makes cilantro taste gross and soapy. I could add parsley as a substitute for cilantro but I didn't have any today. I don't add any spices, but I do like just 1 clove of finely minced garlic. There has to be enough tang from the citrus (both lime or lemon is fine) juice to cut through the richness of the avocado and finally some salt and freshly cracked black pepper. Now go on and try that guac on a hearty slice of toast with some scrambled eggs, maybe throw on some bacon or a slice of ham on top. Halve the avocados, remove the seed, and scoop the flesh into a bowl. Add the rest of the diced and minced ingredients and gently mix and mash with a fork until it is as chunky or smooth as you like. Season with salt and pepper. To store, press a piece of plastic wrap directly on the surface of the guacamole to prevent the guacamole from turning brown due to oxidation (keeping the seed in the guacamole is a myth). Yum! I love guac. Have you tried edamole? Made with edamame. Also very tasty, and good for when you can't find decent avocados. Mmmhhh, that looks good. I like how it's all just fresh stuff and no 'fillers'. I'm a guacamole purist -- just avocado, tomato, lime, onion, salt. I make mine in a molcajete that I brought back from Mexico. I'm with lydia, just the basics and I like it chuncky! I also use to have the aversion to cilantro, but as time has passed I have begun to enjoy it. We are HUGE guac fans here. I make mine similar to yours but I sometimes add a dollop of sour cream in there to extend it a little bit. guacamole is my favorite, too, and yours is just lovely. I love the soft lighting and colors in that photo. And of course I love the guacamole! LOVE guacamole -- but I've never tried it with scrambled eggs! I will have to try that soon, seeing as I looove scrambled eggs too :). Throw in some toast, and it sounds like the perfect Sunday morning! i want to live in a place where avocados will appear in my CSA box. i haven't even starting *getting* my CSA box yet! Hey! Since I see that you are a fellow corn lover, I'll let you in in my summer guac secrets. I love to add a little corn from the cob, and some basil. I think that it has a really fresh taste to it. You can grill the corn, or use it straight. BTW, thanks for the awesome shrimp and corn chowder recipe. I ate three bowls for dinner tonight. I like guacamole but haven't had it chunky like yours, Amy - YUM! Nicely done. Any tips on how to keep the avocadoes/guac from turning? Sadly, I don't think Steven will ever like cilantro. The avocadoes didn't come from the local area but were still a welcomed addition. Grilled corn sounds like a tasty twist. I'm so glad you liked the chowder! Cover the guac with some plastic wrap pressed directly on the dip. Make sure there are no bubbles/air pockets. Oxygen is what makes it turn brown so you don't any air to come in contact with it. Delicious! I like the bright tomato chunks in it. I can't get away with that because of weird tomato haters in my house. oh yes! guacamole on everything is a must!! Are you "shuddering" b/c you don't like mayo in general? My grandma makes guacamole both ways -- with mayo (no sour cream) and without. I like both equally.